Why red and why the shape? Red: Falu red or falun is a dye that is used in a deep red paint, well known for its use on wooden cottages and barns. The paint historically originated from various copper mines in Sweden. Most well known is the mine at Falun, in the province of Dalarna. In Finland, falu red is known as punamulta ("red earth"), after the pigment, which consists of finely divided hematite. Since the binder is starch, the paint is permeable to water. Origin: The red Dala Horse(Swedish: Dala häst) is a symbol of Sweden. The little wooden horse originated in the landscape Dalarna (in the middle of Sweden). 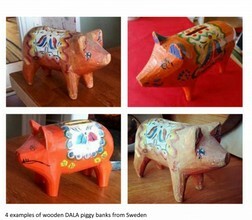 The Dala piggy bank, Swedish folk-art, is made of (two parts) of wood and is as the horse an old tradition. This Dala pig was used as a model for the earthenware piggy banks, made of red clay and traditionally colored red and hand painted with flowers. 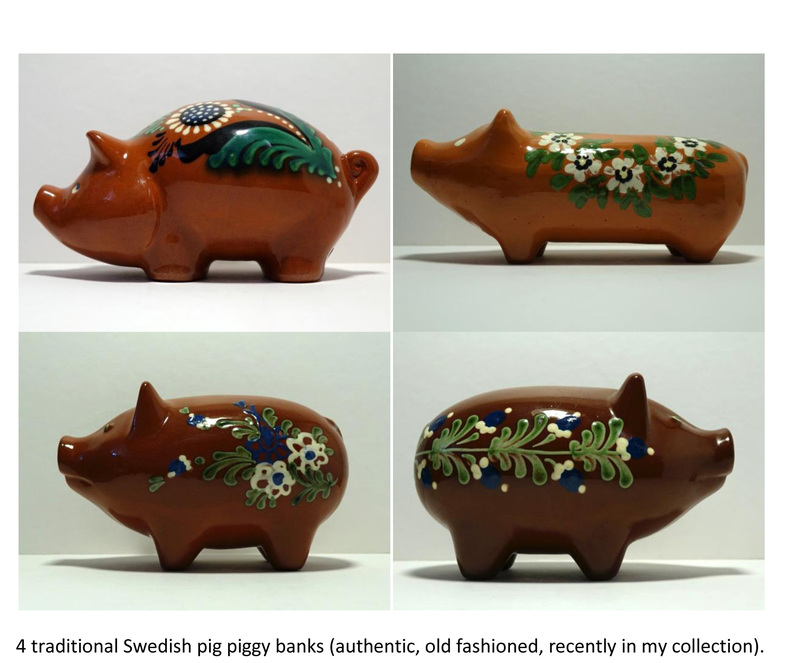 Swedish earthenware (mainly tableware) is famous with brands as Nittsjõ, Guldkroken, Rorstrand (the 3 even make/ made piggy banks!). 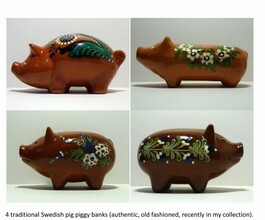 Holmegaard, of the glass design piggy banks, is also Swedish.